The use of periodically correlated (or cyclostationary)processes has become increasingly popular in a range of researchareas such as meteorology, climate, communications, economics, andmachine diagnostics. Periodically Correlated Random Sequencespresents the main ideas of these processes through the use of basicdefinitions along with motivating, insightful, and illustrativeexamples. Extensive coverage of key concepts is provided, includingsecond-order theory, Hilbert spaces, Fourier theory, and thespectral theory of harmonizable sequences. The authors also providea paradigm for nonparametric time series analysis including testsfor the presence of PC structures. 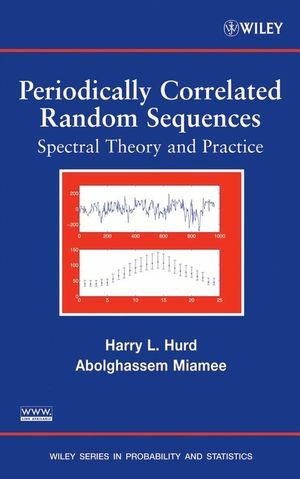 Periodically Correlated Random Sequences is an ideal text ontime series analysis for graduate-level statistics and engineeringstudents who have previous experience in second-order stochasticprocesses (Hilbert space), vector spaces, random processes, andprobability. This book also serves as a valuable reference forresearch statisticians and practitioners in areas of probabilityand statistics such as time series analysis, stochastic processes,and prediction theory. Harry L. Hurd, PhD, is Adjunct Professor of Statistics at TheUniversity of North Carolina at Chapel Hill. He is the founder ofHurd Associates, Inc., a research and development firmconcentrating in the areas of signal processing and stochasticprocesses. Dr. Hurd has published extensively on the topics ofnonstationary random processes, periodically correlated processes,and nonparametric time series. Abolghassem Miamee, PhD, is Professor of Mathematics at HamptonUniversity in Virginia. His research interests include stochasticprocesses, time series analysis, and harmonic and functionalanalysis. 2. Examples, Models and Simulations. 2.1.2 Sums of Periodic and Stationary Sequences. 2.1.3 Products of Scalar Periodic and Stationary Sequences. 2.1.4 Time Scale Modulation of Stationary Sequences. 2.1.6 A More General Example. 2.1.8 Periodic Moving Average Models. 2.1.9 Periodically Perturbed Dynamical Systems. 2.2.1 Sums of Periodic and Stationary Sequences. 2.2.2 Products of Scalar Periodic and Stationary Sequences. 2.2.3 Time Scale Modulation of Stationary Sequences. 2.2.5 Periodically Perturbed Logistic Maps. 2.2.7 Periodic Moving Average Models. 3. Review of Hilbert Spaces. 3.6 Spectral Theory of Unitary Operators. 4.2.1 Infinite Past, Regularity and Singularity. 4.2.4 Spectral Theory and Prediction. 4.4.1 Infinite Past, Regularity and Singularity. 4.4.6 Spectral Theory and Rank. 4.4.7 Spectral Theory and Prediction. 5.3 Limit of Ergodic Average. 5.4 Linear Time Invariant Filters. 6. Fourier Theory of the Covariance. 6.1 Fourier Series Representation of the Covariance. 6.2 Harmonizability of R(s; t). 6.4 Covariance and Spectra for Specific Cases. 6.4.2 Products of Scalar Periodic and Stationary Sequences. 6.6 Lebesgue Decomposition of F.
6.7 The spectrum of mt. 6.8 Effects of Common Operations on PC Sequences. 6.8.1 Linear Time Invariant Filtering. 6.8.6 Periodically Time Varying (PTV) Filters. 7. Representations of PC Sequences. 7.1 The Unitary Operator of a PC Sequence. 7.2 Representations Based on the Unitary Operator. 7.2.2 Another Representation of Gladyshev Type. 7.2.5 Representation Based on Principal Components. 7.4 PC Sequences as Projections of Stationary Sequences. 8. Prediction of PC Sequences. 8.3 Periodic Autoregressions of Order 1. 8.4 Spectral Density of Regular PC Sequences. 8.4.1 Spectral Densities for PAR(1). 8.5 Least Mean Square Prediction. 8.5.1 Prediction Based on Infinite Past. 8.5.2 Prediction for a PAR(1) Sequence. 9. Estimation of Mean and Covariance. 9.1 Estimation of mt : Theory. 9.2 Estimation of mt : Practice. 10.4.1 Spectral Coherence for Known T.
10.4.2 Spectral Coherence for Unknown T.
10.5 Spectral Estimation : Practice. 10.6 Effects of Discrete Spectral Components. 10.6.1 Removal of the Periodic Mean. 10.6.2 Testing for Additive Discrete Spectral Components. 10.6.3 Removal of Detected Components. 11. A Paradigm for Nonparametric Analysis of PC Time Series. 11.1 The Period T is Known. 11.2 The Period T is Unknown.